An activist of migrant workers’ rights, John Gee was at the time of interview President of Transient Workers Count Too (TWC2), a non-profit organisation that is concerned with the welfare of migrant workers. Among its initiatives, TWC2 has launched a “Day Off Campaign” for foreign domestic workers as well as campaigned for a standard contract for domestic workers and their employers. John Gee is also co-author of “Dignity Overdue”, an account of what TWC2 does and advocates. Kwee Hui Kian from s/pores talked to him about labelling, migrant workers and his work in TWC2. This interview was held in September 2010 at Mr John Gee’s residence in River Valley Road. (J: John Gee, H: Kwee Hui Kian). H: Good afternoon, Mr. Gee. Thanks very much for agreeing to this request for an interview with our e-journal s/pores. For this special issue, our intention is to speak to some social activists about their convictions, activities and also about their personal reflections on how labelling has served as forms of discrimination and acts of disciplining in the Singapore society. J: Yes, about labelling… people say “maid” easily, and everyone knows what a “maid” is. There are a lot of assumptions that go with that. The status of people seen as maids in the past was generally very low, associated with unskilled work around the house which was under-valued by employers and by society at large. And so when we reflected about this, we thought that “foreign domestic worker” would be a better term. “Domestic worker” puts the relationship on a new basis, that this is somebody who works for a living, earning money, and so it would give them more respect…. The other thing is, whether to use “foreign worker” or “migrant worker” as a generic term. We prefer “migrant worker” because the term “foreign” often suggests a sense of removal of the host country from the people who came from somewhere else. So complaints are often couched in terms of foreigners who came to take our jobs etc. It’s generally associated with complaints, it’s not just a descriptive term of status. That’s why “migrant workers” is a good description. And this term also did not have a kind of baggage of general public use associated with it. 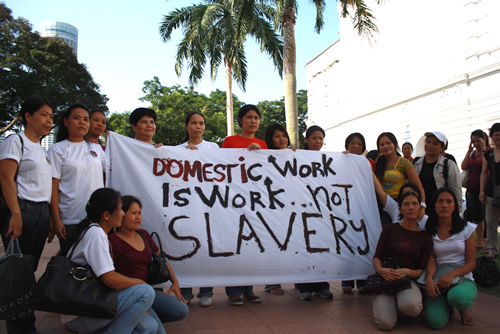 H: Besides “maids” or “foreign domestic helpers”, what other groups of people does your organization deal with? J: The “work-permit holders”, generally male workers from the construction shipyards. In the news reports and blogs about them, they are portrayed as people who are very focused on earning money to send back home. Generally, they tend to be law-abiding, except in littering, that’s a problem issue. But otherwise, when it comes to what we would call real crimes, the incidence of those is very low. Yet somehow there is a perception in the public that they are a kind of parasitical, dangerous, criminal group, likely to resort to sexual harassment and all kinds of things. And this is just not warranted by the records, police records etc. So the general image is considerably at variance with what’s out there. Statements are made, particularly in blogs, that someone’s mother, elderly people and children would not be safe with these workers residing in the neighbourhood. The implication is that they would be attacked by these workers, whether they are walking outside or at home. You can see this particularly from the comments made at the meetings the Serangoon Gardens residents held about two years back, to protest the workers’ housing there. If you look into the internet on Serangoon Gardens and foreign workers, you will find a lot of information there. Then a journalist from Today did a report about the police figures on crimes, and found out that you are more likely to be a victim of crime at the hands of a Singaporean or PR (permanent resident) than a foreign/migrant worker. That was interesting and there were people who said that that can’t be true but those were the real figures the reporter came up with. H: Fantastic, so the real figures and perception do not tally. J: Yes, and there are websites protesting against the presence of foreign workers. One of the things circulated was about domestic worker abusing a child. And it’s actually a video from Malaysia which was made about 5-6 years ago, but it was circulated as if it happened in Singapore yesterday. It’s just these kinds of things. Sometimes it seems like obsessive, anti-foreigner hatred, and it’s no help when in alternative media, people don’t distinguish between different foreigners. Foreigners become one mass. So you then find as a result that people make complaints in their blogs on foreigners, and you recognize that within that one title, what they are saying covers highly-paid executives, and low-paid migrant workers. And you mix that together, saying that people come from abroad to take our jobs and the government helps them and so on. Now when you are dealing with low-paid migrant workers, none of these would apply. They come to do jobs that are not filled by Singaporeans and will not be filled by them even if they are paid four times higher than what these workers are being paid. And they are not helped to settle down. There is an irony here: if you are a foreigner who is in demand, say by a bank, you would be helped with your move, you will find that there are organizations that exist to help you settle down in Singapore. But if you are a foreign worker, the chances are, you will pay someone else to help you get to Singapore and you may sell your home in order to do that or go deeply into debt. There is no organization to help you settle down or to meet your expenses and manage them. It’s very different, so to lump them together is completely unrepresentative of the real situation. H: But would you agree that when people say “foreigner workers” in Singapore, they know that they are talking about the low-paid, blue-collar workers…? J: Yes, but when you remove the word “worker” from it and just talk about “foreigners are doing this…”, “foreigners are doing that…”, “foreigners are allowed to do this…”, then it leads to that kind of marrying together of these two groups which are actually very different. H: How many categories do you think are existing in the Singapore society about these different types of foreign workers? J: Well, I think what people complain most about is when they see people who are highly-paid and believe that their jobs could have been done by Singaporeans, should have been done by them…. What employers are thinking, and why they think they have difficulties meeting demand from Singaporean sources, are questions I would ask. But that is a different issue than a blanket approach to foreigners…. And even at the top level, ok, I can accept that perhaps this foreign person was the best person for the job, but the need for more provisions to identify promising locals, and see how to help them get the experience and the training to become fitted for those jobs which before you maybe had to look abroad to fill. There could be more assistance there. But this is the kind of approach that needs to be taken…. I think what’s needed is to apply analytical tools and look at what’s realistic and reasonable among complaints and what really looks more like prejudice rather than anything else. H: Just to turn the conversation to your personal reasons for getting involved: how long have you stayed in Singapore and what draws you to work with the organization, TWC2 (Transient Workers Count Too)? J: Oh, I first came to Singapore for a short visit in 1980, because my fiancée is a Singaporean, and she is now my wife. Her family was then employing a black-and-white worker, the so-called amah, who was from China originally and had worked for them for some years. This worker was already pretty old then and she retired a few years after my visit. But to me it was a very strange experience to be in a household where there is a domestic worker of any description. And when I came back again to Singapore in 1999, I realized that there were a lot more domestic workers than before, and they were clearly from another background. The amahs were Chinese or Indians, and were usually of the same background as the people who employed them, except those who worked for Europeans. But when I came back, I was very aware of the huge rise in the number of workers from abroad – particularly the domestic workers – and also became aware of a lot of things, like the ways they were treated, which seemed to me to be unfair. H: How did you come to be aware of that, from the papers…? J: No, it’s very visible if you are not a Singaporean. If you are in Singapore, there are a lot of things that you accept, and as a Singapore citizen, you stop noticing them because they are normal. Because you see them as normal, you can walk past these things and never take notice of them. But when you are a foreigner, you notice immediately, that this is something different from your experience. So a lot of foreigners for example, will comment on the workers being transported in lorries, because they see this, and they don’t see it in their own countries, it’s illegal. H: So it’s just really through day-to-day observation. J: Yes, and just being in a social environment hearing people talking about a domestic worker, in her presence, and they would say things about how stupid she was, or she didn’t know how to do this and that, and she was there! But people didn’t seem to think that was a reason not to say these things. One of the issues that occurred more often in earlier years was how people would go on Sundays to lunch with their families, and they would take the domestic worker along, and she was there to look after the kids. Sometimes she didn’t get any food, or she might get their leftovers. And there were people, to their credit, who were writing to the papers and saying that this was very bad behaviour, you know, why can’t people be more considerate to their workers. And of course, coming from a country where there were hardly any domestic workers of any description, this just seemed like something that was very bad and unthinkable. So, I wanted to do something then, and when I heard that a group was getting together to work on this question, I joined, so that was when TWC2 was in the idea stage in 2002. H: So you helped form the group? J: I was in from the second meeting onwards, and then later on we went from being “The Working Committee 2” to “Transient Workers Count Too” and we worked with male workers as well as domestic workers. H: How did you get started? How did you put it out to the foreign workers that they could get help from your group? J: The funny thing was, when we began, we decided that we weren’t going to be doing help services, we were going to focus on advocacy: it wouldn’t involve a lot of, if you like, case experiences. But to do research, we spoke to workers and we learned about a lot of the problems they were facing. And we’d barely got started when people started to call up for help. So then we improvised about how we would give assistance. But the help services were really something that started in response to demand. It wasn’t that we went out and stimulated it. H: Ok, so you really started as a research group…. J: It started to do research and advocacy, and the research would underpin the advocacy. The intention was that we focus on changing the conditions that produced the things we feel are objectionable. So one of the basic things we are calling for is a day off per week for everybody in fact, but definitely for domestic workers…. H: What other things do you advocate for? J: That’s been the longstanding one. There are also other things we raised over the years, some of which have been addressed by official actions to varying degrees. One issue that came up was about regular, reliable payments for workers. Now there are still many complaints about this, but there have been steps taken, and there was a rule that people should pay workers at the end of the month, or within six days at the end of the month. Anyway, they can’t tell a worker that I will pay you next month, I will pay you next month… and then we come to a situation, there was a worker we saw who has not been paid for three years…. J: Yes, and her boss was always telling her that they were going to pay her later, that they were just having some difficulties at the moment. And we were coming across quite a few cases of these debts piling up. The Ministry of Manpower (MOM) emphasizes that these cases should be brought up earlier, after a month or two of non-payment, so that it’s much easier to resolve. We are seeing more effective measures against these things. H: So your advocacy is mainly to the MOM? J: It’s to the MOM, but we have also written to the ICAS (Immigrant & Checkpoints Authority of Singapore) and some other official bodies. We have spoken to some MPs (Members of Parliament). But the MOM is the logical address for most issues dealing with migrant workers. And we are also in touch with the media and anybody whom we feel has some interest in the issues. H: When did you become president of TWC2? J: In March 2007, before that I was vice-president. H: About the members of TWC2, what kinds of backgrounds are they from? Do they share similar concerns like yourself? J: I would say the general concerns are similar but people come by different roads. The majority of our members are Singaporean nationals. And the next largest group would be migrant workers, followed by the expats. But the expats sometimes have more time than the others and they could put in a disproportionate amount of time as volunteer helpers. J: You know, like somebody who is a spouse of another who has got a job. They may not even be able to get a job themselves. And we also have people come who are studying or doing projects, and so they could put in some time while they were doing the study. H: Do you see an increasing resentment against foreigners over the years? J: I would say that there has been. It’s partly because of the larger number of foreigners coming. But there is also the sense of Singaporeans maybe not getting all the job opportunities that they should get. H: Do you think that is a real issue? J: I think that is a real issue, but it’s not out of keeping with more developed countries actually. If you go to practically any developed country, you will find that there are movements that are based on criticizing the influx of foreigners, and they would say there are many foreigners, and they are taking our jobs. It’s just standard. Say for instance, my wife’s family, she is one of six children. She has a brother in America and two sisters in London who presumably, nativists there would say have taken away their jobs. So there’s an outflow of Singaporeans who are taking up well-qualified jobs elsewhere as well as an inflow [laughs]. And you run across similar types of complaints, using similar kinds of language, and the same kind of logic, of grouping all these foreigners together and they are all committing the same sins. It’s actually a very spontaneous response. But on critical examination, it often turns out to be rather more complicated. H: You are right to say that this issue is standard, I think…. But do you think there is something in Singapore that the way the government or the society here approach the issue that has its own characteristics? J: Yes, it’s interesting, one of the things that I notice was different was that, up to the 2008 recession, I think the Singapore government was very strong on saying, ya, we need foreign workers, we need foreign talents. And clearly since the recession, the government then became a little anxious, that there was an increase in the volume of complaints about foreigners and the numbers were going up. And so the government became more defensive in its reaction. Now, that’s different from the position in most developed countries. For instance, the governments in Western Europe tended to be much less inclined to defend the need for foreign workers, even though the policies continued that allowed labour mobility because those workers were needed. But often people didn’t stand up, it was left up to anti-racist movements or journalists to stand up and say, put things right. And it wasn’t government that did this. So Singapore’s government was taking a more positive stance before 2008, though now it is becoming more ambivalent. It’s still arguing the need for foreign workers but it’s saying we are putting up a higher levy to discourage the use of foreign workers and we are looking to slow down the influx. I think the overall tone of that is to imply a rather more negative phenomenon, that the drawbacks were bigger, than they would have acknowledged before. H: But the government before 2008, if I recall correctly, was that they defend the need for foreign talents. H: And the government did not so much defend the blue-collar foreign workers, the work-permit holders, so to speak. I was just reading the National Day rally speech by PM Lee Hsien Loong, and he was really putting out the message that we are doing this, this, this… so that Singaporeans are seen as much more valued. What do you think of it? Do you think it is a kind of ploy for the next election or…? J: I think the government is quite good at sensing public mood. I suppose the international image and the home image to parts of the population is that Singapore government tends to be ready to take a decision and will stick to it, and it’s rather rigid. But in fact, I don’t think this is the case. It’s actually very aware of the need to cultivate public support. For instance, about the discussion on the integrated resorts, it was almost like it’s a trade-off, that we are going to go against a large sector of public opinion by opening the integrated resorts, but we are going to conciliate these types of conservative opinion by not doing away with discriminatory measures against gays and lesbians. So, all the time, you feel that there is a kind of balancing act going on. The idea that the government will steam-roll through, regardless of what anybody else think, is not true. There’s political calculation involved. I think the speculation about measures introduced with the general election in mind, is true, but it’s not really out of the style of politicians worldwide. But the issues that are picked on in a speech like this show what the government assessment is of the state of public opinion and the things that are going to be persuasive and not persuasive. And I think on the migrant workers’ issue, the government feels that it doesn’t want to be in an exposed position, and so there is a need to find ways of conciliating public opinion and soothing disquiet. H: I do agree with you. About your experience of being an advocacy group, of having to write letters to the MOM, ICAS etc., how do you feel was the response? Do you think that they are genuinely trying to make it better? J: In some ways, yes, particularly on things where public opinion is shifting. I mean, I think these days, one big difference I notice between when I first arrived and now, is in public attitude, when it comes to physical abuse of domestic workers. The incidence has been going down since then. And I think it partly reflects a shifting outlook in Singapore. When we started off, we were quite appalled that for a lot of people, the attitude was, it’s not my business, what my neighbour does, that’s their business. And there wasn’t much inclination to intervene on behalf of somebody who is badly treated. But I think these days most people, if they are aware of ill-treatment of workers, may want to report it to the police or to the MOM. And if they find that one of their family members is doing that, they are likely to speak up, they don’t just walk away from it anymore. And that’s quite a big change. We are not there yet, we have not, like, completed the transition but there has been a visible change in attitude and behaviour. H: Right, ok… and what about the government? J: The government’s temperament changes very slowly. The abuse issue was a case in point. Where public opinion stands is very clear. And it has become stronger as the government became confident with the change in public opinion, so the government was helping to shape public opinion but it was also in a stronger position then to go through with policy initiatives that may have been less readily accepted before. For example, I can see a shift going on, like on the transport of workers on open-back lorries. The government has the employers to answer to, who would say it costs too much money to transport them in buses. But I see increasing signs that a growing proportion of the public objects to this. They want to see a change, and they want to see people transported in safe and decent modes of transport. H: How did you assess these changes? J: Through blogs, newspapers reports…. For instance, about the crash that took place recently along the PIE (Pan-Island Expressway) in June 2010 where three male workers transported on an open-back lorry were killed, most of the responses were that they were very sorry for the workers and that this mode of transport shouldn’t be allowed. Then somebody who’s an employer wrote in, and said that it’s too expensive to pay for enclosed vehicles for the workers. And virtually all the responses to that were critical of the employer. So it’s kind of interesting that that’s going on. Even among people who are unhappy about the presence of foreign workers, they’re not necessarily excusing inhumane treatment of workers. They often combine attitudes that are hostile with attitudes that are sympathetic. I don’t think it sort of works out all one way or the other. H: It’s interesting that through these concrete cases of crashes and the kinds of responses that were given are sometimes very different from generally expressed opinions. J: Ya, and it’s noticeable that when the three workers were killed, public response was overwhelmingly sympathetic to the workers…. I mean there are definitely people who are committed in terms of the rights of the workers and are genuinely sympathetic. But then I think there are others who tend to regard workers as almost like cogs in the machine. And they are more concerned if they are efficient than with whether they are cared for. So this is a problem. But the attitudes are not consistent and definitely there’s another element that’s taken into account, that is the diplomatic relationship with foreign countries, particularly the relationship with neighbouring countries, so that’s something that cannot be ignored. And I think Singapore generally doesn’t want to have stand-up fights with Indonesia or the Philippines or China or India. H: That’s for sure. What do you think of the fact that they obviously needed these blue collar workers but they just wanted to keep them temporary? J: The government does not want people to be settled in Singapore long-term, and definitely not to start a family, and that’s written into the work-permit conditions. But certainly if you ask the workers themselves, one of the things that they feel quite sad about is the lack of contact with their families. I mean, just yesterday I saw a worker who has been in Singapore for about eight years now, and he is a building worker, and he showed me a picture of his daughter. But actually the last time he saw his daughter was when she was six weeks old…. H: He has never been back? J: Not been back in eight years… he’s going back soon, his first time back…. H: So why was he looking for you? J: He looked for us because his legs were broken at work. H: And that’s why he is going home? J: Yes, he has had medical treatment and he has reached a stage where soon he will be able to go home. It will take a little while for him to be fit to work in any job…. H: So he hasn’t seen his daughter all these years…. J: No, he hasn’t seen his daughter as he came over when she was just born. Most workers get back more often than that but what often happens is that you get to the end of your standard two-year contract, and you want to go back but sometimes your employer wants you to stay on. And they offer you some kind of incentives. So of course what you will get is two weeks of extra pay. Your employer may also say, it cost me this much for the airfare back but I could split that with you if you stay on. So the employer keeps half the airfare and the worker gets the other half…. If the worker wants to stay on, the worker often has to compromise, but it may be that the worker feels he has not earned enough money yet, and it’s better to stay on and earn some more money and not take the break. So these are some reasons why some workers may want to stay on rather than go home. But normally when workers do that, they will not stretch it to more than four years without going home. And then the desire to go back is such that they will take the chance to go back. But where it works out longer it can be that the family contacted the worker to say that they needed more money, for some expenses that have to be met, and then the worker then feels he has no other choice than to carry on working. H: So the general complaint from the workers is that they don’t see their family back home? H: And very few will want to settle here…. H: [laughs] What about the other part of the group? J: The other part, they tend to be very family-focused. They want to earn money to go back and marry. So they have that in mind and they want to have the resources, particularly for men, the idea that they’ve got to have these assets in order to get a wife. So you save up and you go back with this pot of money, then you are more likely to attract a wife. With women who are single, they often part with all that money and send it home and it will support a younger brother or sister, or help a family cope with bills, and sometimes those women go back with no money. They may work as a domestic worker for 8-10 years and then go back. And they are often regarded as unmarriageable, too old. That’s a very bad position to be in, so when we are speaking with workers, or with unofficial networks, we always advise women to think ahead to a time when they are not domestic workers anymore and to resist the demand to send all your money back, to have some money for yourself, and also try to develop skills to put you in a good stand when you return. And some workers become very astute about that, they become very good planners. H: How do you convey the message? J: It’s talking, when people come to us, and there’s things like the “Indonesian Family Network” as well as some other loose networks among the Indonesian and Filipino workers who we deal with… sometimes they have a get-together and we come along. But we also know people who are key in these networks and they tend to pass the word on. Now there’s more initiatives, more opportunities opening up. For example, there is an organization called AIDHA. 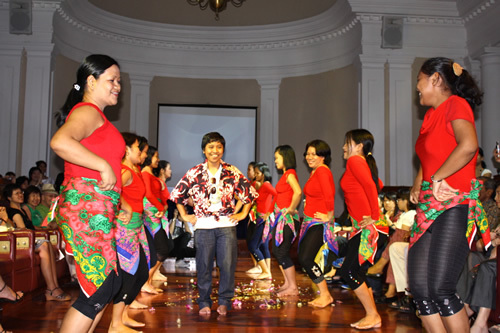 They provide teaching for domestic workers on Sundays. One of the organization’s core missions is teaching people how to manage money, so that when a worker goes home, she has got a chance to set up her own business or manage the money that she has saved up, and she is not going to end up with nothing… and that’s very good. It’s a very young organization and it’s got hundreds of women going through that course already. H: What other organizations like TWC2 have been emerging in Singapore? J: There are three major organizations dealing with migrant workers’ problems. There’s ourselves, there’s HOME (Humanitarian Organization for Migration Economics), and there’s ACMI (Archdiocesan Commission for the Pastoral Care of Migrants & Itinerant People). ACMI is a Catholic organization. It doesn’t do advocacy work. They will give help and advice and they can also access accommodation for domestic workers who are in trouble. So that’s what they do. They can’t provide accommodation for male workers. Accommodation for male workers is very limited in Singapore. HOME has a shelter for 15-20 or so men. And they prioritize people who have accidents or who need shelter as a matter of desperate urgency. H: So the main task of TWC2 is still research and advocacy after the helpline service is established? Is the profile changed? J: Oh, the profile has changed… in terms of the time committed, the great majority is put into help work but we still argue that advocacy is central to what we do, because our approach is that in the long run, we shouldn’t be doing lots of jobs which are to do with repair and salvaging work. It’s got to be preventive. And so to change the status of migrant workers is much more important to us, to bring about a situation where those abuses and non-payments and all the horrible things we condemn don’t happen anymore. H: Do you have vision for these migrant workers? Like perhaps that they have a right to settle down in Singapore…? J: We would like to have more flexibility about that. Certainly where people who have fallen in love, or where they have been working and living in Singapore for many years…. I remember a case where a woman has worked in Singapore for 30 years, and yet when she reached a certain age, she would not be allowed to stay on anymore, and has to go back to where she came from. And yet she would have stayed for more than half her life in Singapore. Many things would have changed back home. There ought to be a greater flexibility in it, I think. But it’s hard to see those policies changing while the general climate is one of negativity about foreign workers. They are sometimes seen as a necessary evil rather than as a presence to be welcomed. So that’s the overall approach…. H: Is there a guiding philosophy then, of TWC2? J: Ya, what we would like to see is a much more balanced relationship, of an alliance that meets the interests of both the migrant workers and Singaporeans, and so that each party goes away satisfied that they have got pretty well what they want to get out of the relationship rather than one or the other feeling deeply wronged. At the moment we get migrant workers and Singaporeans both feeling that they have been wronged. Re-forging this relationship, I think, is quite challenging, but I think it can be done. It’s one of those things, like the game of sticks, you’ve got to move one stick without moving the others and that’s actually very hard to do. And this is the same situation. If you do one thing, it can affect the others. And in the end, maybe taking a look at the global picture again, thinking ok, what relationship are we really looking for, at some point. It has come down to that. H: So these are the three main things that your organization deals with: firstly, direct services, including the free food program and helpdesk; secondly, research and thirdly, advocacy. You have a lot on your plate…! How are you handling these? J: [laughs] with difficulty, it is a great deal… we definitely need more help , we hope to get more volunteers, and you come to a certain stage where it is very straining for existing volunteers to continue so we need other people to step forward…. H: Would it fair to say TWC2 is not attempting a revolutionary change like a shift in labour relations? J: Oh no, we do want to see a change in labour relations. I suppose you come to a difficult point which is about if migrant workers have identical conditions to workers in the host countries, they wouldn’t get the job. This is the real dilemma. So, in principle, we want migrant workers to have access to the rights and protection of home workers, so we are in favour of equality and full labour rights and human rights. But the outstanding question, I would say, is the question of citizenship status. And that’s proven to be a stumbling block internationally. So, for example, there is a “Migrant Workers’ Convention”, which has not been endorsed by any host country, that is, countries of emigration have not given it support so far. And one of the key problems there is the issue of settlement. Most host countries are very wary of allowing people the freedom to settle. And you can argue about whether it’s racism, or even a sensible demographic policy. But the fact is, this is the obstacle. And when we look at other areas, the prospects of progress are much greater. So rather than thinking that it’s all or nothing, we look for areas where we could achieve changes, progress, and then there are some areas where we recognize it’s a very uphill struggle. We can maybe open a constructive dialogue but where it will end up is uncertain. Personally, I don’t think the world is ready yet for open borders, and so… it reflects badly on human beings, but nevertheless, it’s a reality. Lots of people in developed countries worry that people from poor countries will just come in and then they will demand everything. We have to reckon with that, and there have to be realistic discussions with a minimal amount of labelling and once you get past that, you can get down to what the real issues are. And it will work best if you move towards a borderless world. Population movements and development are very inter-related issues. And with the development of economies it can be seen that migration is no longer a matter of necessity for people but it’s something they can choose to do if it suits their interests or if they want to see more of the world. It becomes a real choice rather than something you are compelled to do. That’s the way the world should move. And it’s going to take quite a bit of getting there but I think it will. H: Just coming back to the foreign workers’ issue, the more I am having this conversation with you, the more I am thinking, right now, the big hoo-ha is that the government is not even dealing with foreign workers, because they don’t have the right to settle down. J: Ya, they don’t have the right to settle down, they don’t have the right to vote of course…. H: So the only grudge Singaporeans have against the foreign workers – more specifically the work-permit holders – is that they are taking up space in the MRT, or the green spaces they congregate on their free days, say in Little India and Orchard Road. I mean the fact is, these construction workers and domestic workers are not taking away any jobs from Singaporeans. 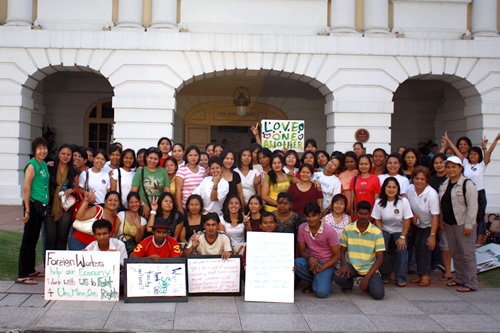 So Singaporeans themselves participate in this labelling of these blue-collar workers as “foreign”, justify their discrimination against them based on this label, and made complaints against them in extremely petty ways; without examining themselves how these workers are needed to do jobs that no Singaporeans wanted and how we should respect them as humans seeking a livelihood. I don’t know, you must think this is extremely petty. Just dealing with Singaporeans and what they understand as foreign workers…. J: I think at some point, it is necessary to say, well, do we need these workers or not. But if you settle to the conclusion that actually we do need to have these workers employed in this country, then you have to say, well ok, how do we then co-exist? And that involves accommodation, to work together and to have some kind of decent co-existence. The idea that you banish foreign workers from your sight as far as possible is obviously very unjust and very impractical, and it’s quite unreasonable. It’s like saying, we’ve got this job and there is this thing we want you to do for us, and we are prepared to do absolutely nothing for you. And you just can’t do that. People in a lot of developed countries think that they can do that, put the foreign workers out of sight because they are a nuisance to you, you don’t really want them around. But actually, to walk over other people in that way is quite wrong. And I think it is corrupting to a society to act as though you have two standards of human beings, who can be treated in these very different ways. Once you institute a system where one group of people is treated as inferior all the time, the tendency is to go towards worse forms of bad behaviour rather than better ones. I think in Singapore, generally, the situation is being turned around somewhat, so there are steps forward but there’s still tendency to foot-drag, and to wish the issue will go away, rather than be dealt with. And I think that is a current problem. With the general election coming up, I don’t think the government wants to do things that are seen as being unpopular. So interventions are going to be very calculated, and it’s not going to venture into controversial territory. H: I fully agree with your assessments…. Thanks very much for agreeing to this interview, Mr. Gee. It has been most inspiring talking to you. I hope this interview will draw more support for the efforts of TWC2 and yourself.